Many of you have started following my blog in the past year or so, and may not be aware that I originally began this over four years ago to share my experience of depression, in the hope that it would help others. From the comments I’ve received since then it appears that this has happened far more than I could ever have hoped, although I admit to having strayed off message quite a lot since then. You will probably also be unaware that I ran a series of ‘Dates To Note’ about key days in the calendar, mostly around health and social care. They can be found from the menu above, if you’re interested. Not wanting this to become stale or repetitive – I can do that without setting myself up for it – I stopped these as a regular feature two or three years ago. But this week has prompted a slight return, to borrow a phrase from Jimi Hendrix. I’m slightly confused by this – it doesn’t take much – but I have seen various references (mostly American, I think) to May being Mental Health Awareness Month whilst here in the UK this week, from 8th to 14th May, is Mental Health Awareness Week. So, we have two ‘Dates To Note’ though as I’m British I’m concentrating on our week. 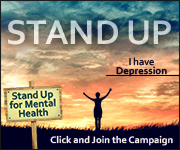 This is organised by the Mental Health Foundation, and you can find their site here. The MHF do a lot of good work campaigning for better mental health, and provide a wealth of useful information on mental health matters. 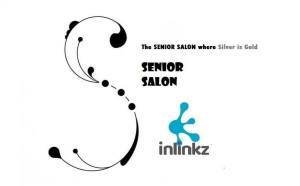 I commend their site to you if you want to know more. If you are in the States the equivalent organisation there is HealthyPlace, and you can find their site by clicking on the ‘Stand Up’ logo at the top of the column to the right. For this year’s Awareness Week the MHF is turning things on their head. As they put it themselves, ‘Rather than ask why so many people are living with mental health problems, we will seek to uncover why too few of us are thriving with good mental health.’ To support this they commissioned a piece of research which has found that, rather disappointingly, only 13% of us feel that we are thriving in this way. The report can be found here – it is fairly short and easily read, and includes a definition of what ‘thriving with good mental health’ means, in case you were wondering. To be frank, I was pleasantly surprised at this, and found some encouragement from it. I would encourage you to take the survey – and if your score is low please consider visiting your doctor to talk it through. I know from my own experience that hiding from yourself, failing to accept that you might need help, can be very damaging. I was eventually off work for more than nine months, and have always felt that this could have been much shorter if I’d accepted the need to do something sooner than I did. So do as I say, please, not as I did! The flip side of this coin is that you could take this test and get a similar result to mine, and think everything is alright. But there are limitations to such tests, and if you are at all worried about your mental health – if you feel that you aren’t thriving – it would be remiss to think that your result means you don’t need to do anything. 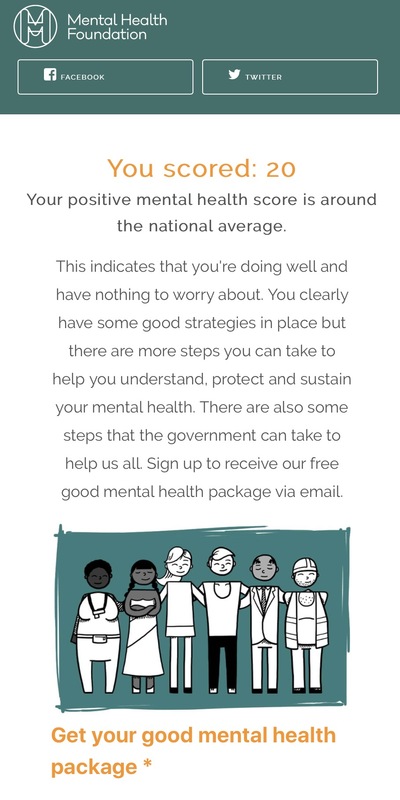 As I say, I’ve had my own concerns recently, and these won’t go away simply because I’m ‘around the national average.’ Our mental health is precious, and I’ll be taking good care of mine, including signing up for the MHF’s package mentioned in the screenshot above. I hope you do whatever you can to look after yourself. I trust that listening to that will have raised your spirits a little! Have a good day, and be well. When I reblogged my post You Go To School And You Learn to Read And Write last week I noticed that it mentioned my having a migraine, and it seems appropriate to follow that up with this. 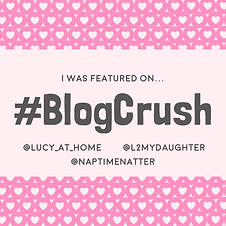 Those of you who weren’t reading or following my blog in the early days will probably be unaware that I used to do a series of posts that I called Dates To Note – if you’re interested they can be found in the menu above. These ran through 2013 into 2014 but I decided that they had run their course and, apart from one or maybe two reblogs – and a spoof – there haven’t been any more since then. I have, however, decided to do a new one-off to recognise that this week (4th to the 10th September) is Migraine Awareness Week. I first posted about this in 2013 and recycled that post a year later, but felt it was about time to do something new. I’m sure many of you have experience of migraine, either yourself or in someone close to you. I was first diagnosed when I was 15 – to save you the maths, that was around 48 years ago. Since then I’ve had several migraines a year apart from one blissful period in my 20s when I went three years without one, and foolishly hoped I was somehow ‘cured.’ Not so. And the older I got, the more migraines I had and the longer they seemed to last! Five or six a year wasn’t uncommon, and they lingered for up to three days instead of just the one when they first started. 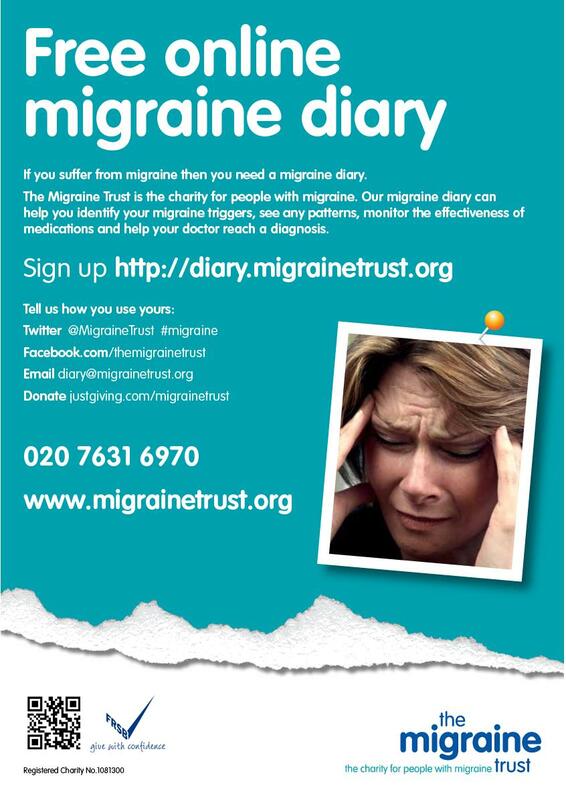 I hope you follow the link above, which takes you to the Migraine Trust’s website. The Migraine Trust organises this week as a means of educating people about migraine, and their website has a lot of helpful information and links. One of the things they encourage you to do is to keep a diary of your migraines and share it with your doctor. I did this when I was first diagnosed with depression, as I seemed to be getting headaches and migraines all the time, and it was very helpful to see what pattern – if any – there was. In particular, the site might help those who say they have a migraine when it is actually a bad headache: believe me, there is a difference and you’ll know it if you’re a fellow sufferer! When I was running the Dates To Note series I always gave a link to the NHS website as this is a very good source of information, and their coverage of migraine is as good as ever. My diary showed that there was absolutely no pattern to my migraines, which often seemed to occur with no prior warning. Most of mine started the moment I woke up: there was no build up to them throughout the day, as some people experience. That made it difficult to assess, but we managed to find a tenuous link to late night tea and coffee, or eating, before some of my migraines. I cut these out on doctor’s advice, but was never convinced that this made any difference. Like most migraine sufferers I just shut myself away in a darkened room until it felt safe to open the curtains again. Medical science has yet to agree on a set of defined causes for the illness: whilst one of the causes is believed to be emotional factors, such as stress, mine have always been noticeably different from regular headaches, which tend to fall into the category of ‘tension headaches.’ Migraines are believed to be a result of chemical changes in the body affecting the genes, and the genetic effect can mean that they are passed through the generations within a family. My Mum used to suffer badly with migraine and it has always been believed that I inherited this from her. So how can you explain the fact that I have had far fewer migraines since I retired? I now live a life which, as far as I can possibly make it, is free from stress and tension. And the frequency of migraines has dropped noticeably – go figure! Does this mean that what I have believed for nearly 50 years was wrong? Even if that is the case, I can’t really see how I could have changed my working life to remove stress factors, which were part and parcel of any job I had. But I do find it interesting that a reduction in the number and length of migraines since I retired may somehow be related to that major lifestyle change. Next week, it will be three years since I retired, and I can only recall three or four migraines in that time – when I would probably have endured something like 20 in a similar period whilst working. I’m intending to mark my anniversary with a post or two, but wanted to kick off the celebration of my third post-work birthday a little early to tie in with Migraine Awareness Week. It just seemed a good fit, somehow.